Today was a conflicted day for me, it's been cloudy, overcast and rainy, we NEED this moisture, no doubt about that, but all these overcast days are not so good for my solar system (we are 100% solar powered), today it was foggy all day, which is normally a cool thing, it makes everything look mysterious. But because we aren't getting much sun, I have had to curtail my internet usage quite a bit, now THAT bums me out, I've just been doing the minimum I could on my computer and internet has been a challenge. I have had to remind myself about the good things about living the way we do, this simple life, we have food, we have great friends and neighbors, we are healthy, we have shelter, my walk with my Lord is stronger than ever, so who am I to complain? Today, I went through all of my photos and found a simple daisy, white petals with a yellow center, it reminded me that spring is coming, dreary winter will soon be over, and life is good. 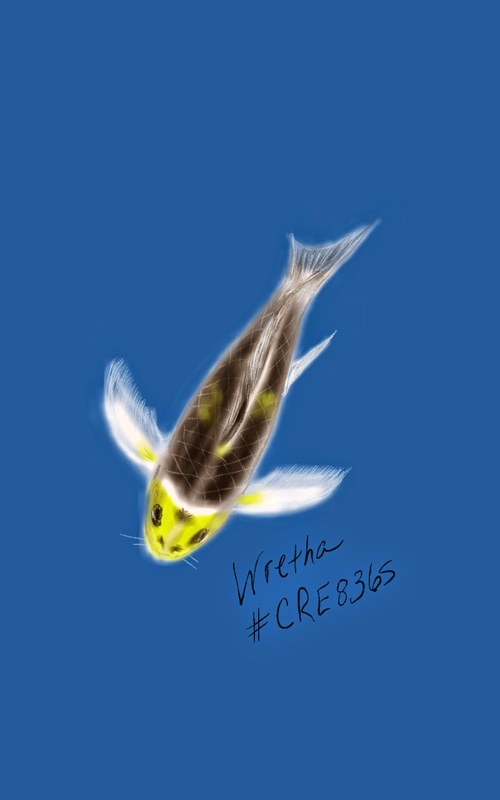 I did this using Autodesk SketchBook Pro mobile, and finished it in Photoshop. 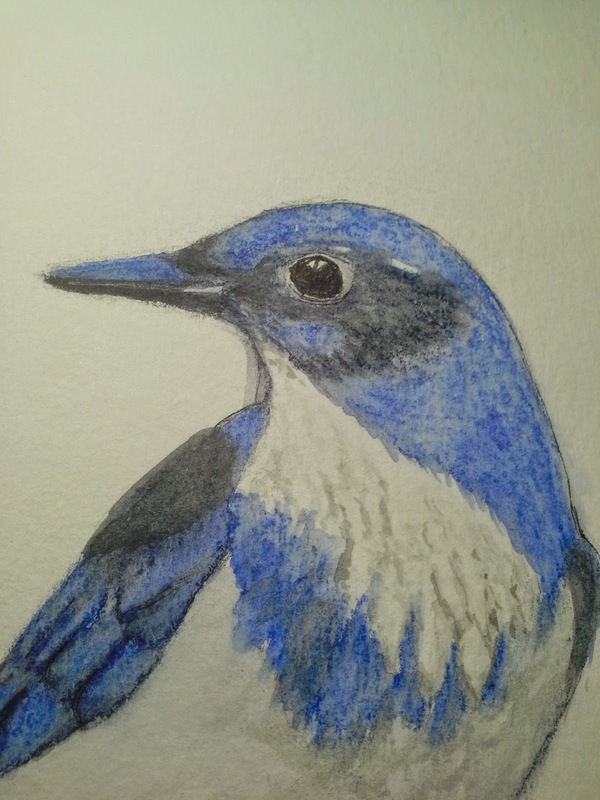 Anyhoo, I whipped out my watercolor paper and my Derwent Inktense pencils and Derwent Inktense blocks and did this image, I think it's about the 3rd time I've done this same bird, but that's OK, it's one I'm familiar with and I needed to get it done before he left. Day 2 of playing around with Autodesk SketchBook, I was planning on doing another big headed critter, I looked for reference pictures of jack rabbits, a critter we have a plethora of out here, well the big headed part didn't happen, maybe next time it will. Our jack rabbits are pretty big, but thin for their size, their legs are long, especially the rear legs, and they have very long ears that you can almost see through they are so paper thin, that's how they dissipate heat in the summer. They are skittish animals, I love seeing them, except when I am driving, they run zig zag in front of your car, and just when you think they have finally left the road, they race back in front of you to do it all over again. 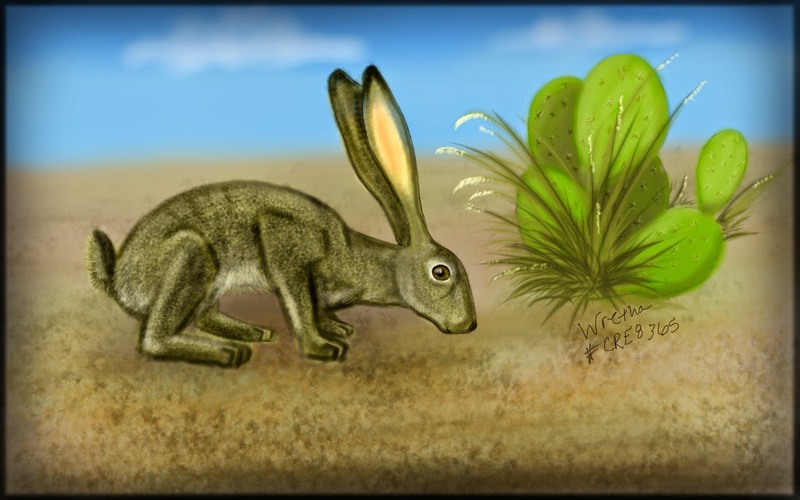 I looked at several different reference photos to get the jack rabbit and prickly pear cactus just right, I am pretty happy with this one, one detail you might notice is the grass in front of the cactus is called Texas Grama . I did have to finish it in Photoshop to bump up the color saturation and contrast. Use your right-click to view full size. 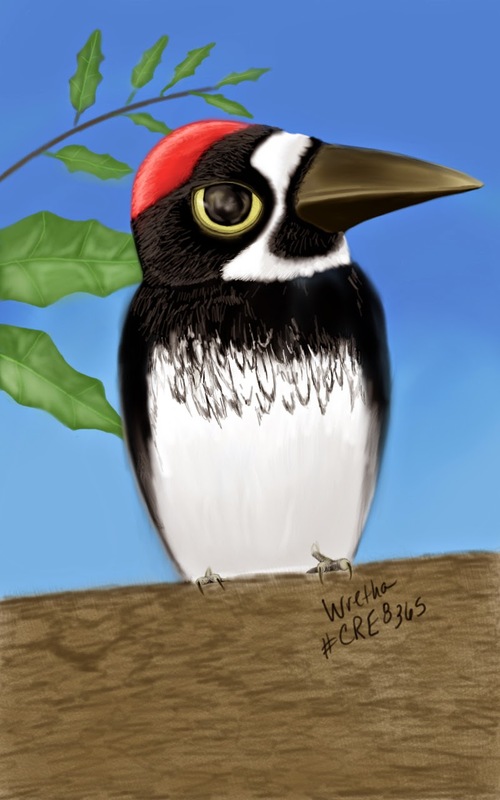 In keeping with yesterday's theme of big headed birds, I decided to try my hand at rendering a big headed Acorn Woodpecker, this one was done on a different program, I decided to go ahead and get an app called Autodesk SketchBook, there is a free version, but I went ahead and purchased the Pro version, at just under $5.00 I felt like it was worth it to have all the extra features. I played around with the different brushes for a bit, then got down to business with this image. Some of you might recognize this from the Christmas cards I did, I used the reference photo of the Acorn Woodpecker and made it's head (eyes and beak) really big in proportion to the rest of it. I also added in a bit of a background with Scrub Oak tree leaves. I am blown away by the new tools I have at my fingertips, the layers, the blending, the ability to turn the image and zoom in so much on my tablet. I was scrolling through Pinterest and one of the images jumped out at me, this artist (an artist duo) created some paintings/illustrations that are realistic with a big dash of surrealism tossed in for fun. 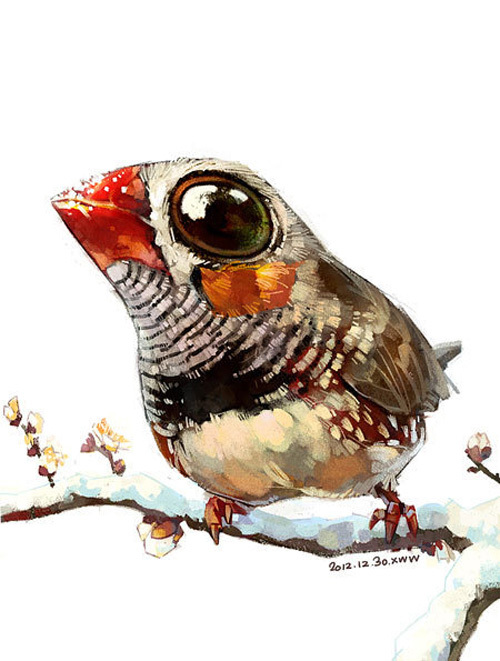 The image I saw was a zebra finch with an almost ludicrously large head, eyes, and beak. 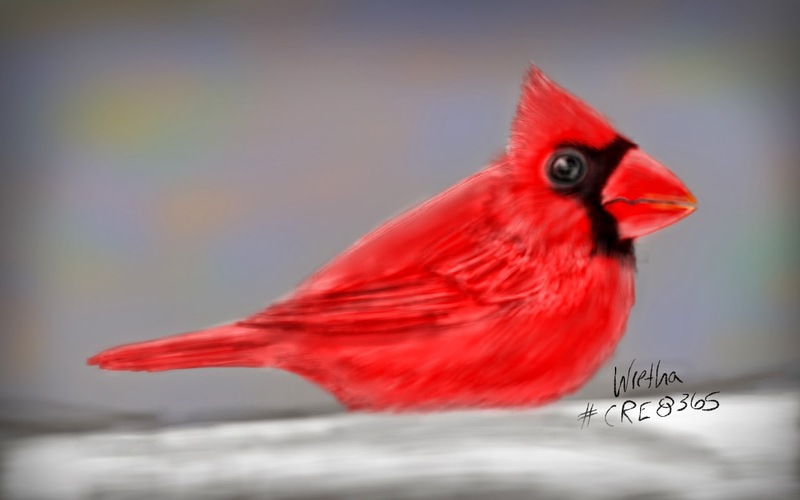 I had an image of a cardinal bird that I had been wanting to paint, so I took this artists' style and applied it to the cardinal and this is what came out. No one would mistake my rendering for something these artists may have done, but it certainly stretched my horizons. My image was created using Sketch Guru and finished in Photoshop. A few years back I drew a koi in a pond with lily pads, this was inspired by another artist's painting. I wanted to do something somewhat serious in a less than serious medium, Crayola Crayons, what is less serious than crayons? 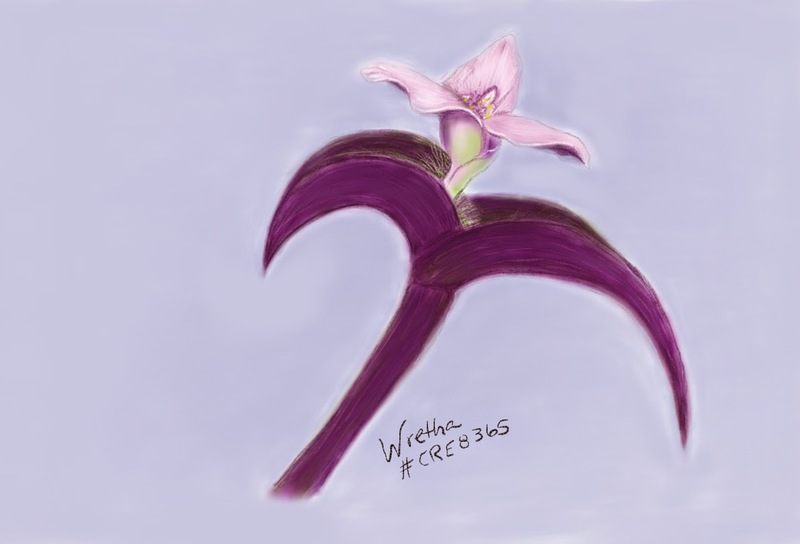 I am pretty happy with this one, it's a drawing/painting of a blossom from the Wandering Jew plant in our window. I created this using Sketch Guru and finished it in Photoshop. This took me 3-4 hours though it didn't seem like it was that long. I feel like I'm getting a handle on Sketch Guru, it's a fairly simple app, but it has lots of potential. I pretty much only use 2 of the brushes available in the app, the line and spray. The only thing I wish that program had was a way to blend or blur, but so far I've been able to work around that limitation. 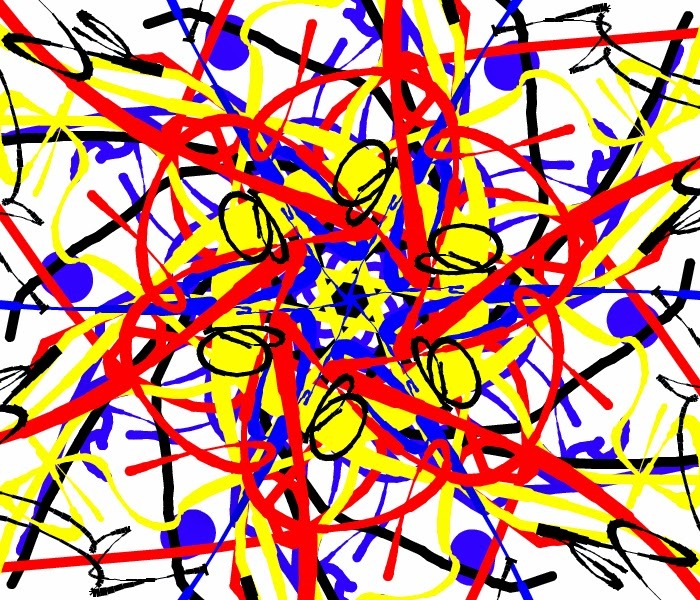 I drew this image using an app called "Draw and Paint Pad", it's for Android based systems. 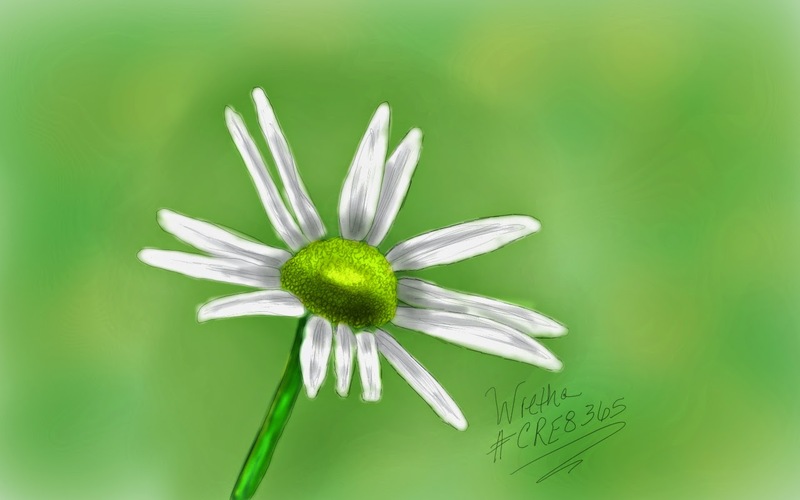 This is the first thing I've done with this program, I am not as comfortable with it as I am Sketch Guru, but I suspect that will change as I work with it more. After uploading the Silly Penguin image to CRE8365, I was asked by Pixelista if there were any tutorials for Sketch Guru, I looked and couldn't find any that suited me, so I dug out my gear and made my own video tutorial. I had hoped to make it short, but it ended up being a half hour long, so I uploaded that one to YouTube, then created another version as a speedpaint tutorial, that one is much shorter, so people can watch either or both. Our weather has been so crazy, going from days and weeks of gray, ice fog to shirtsleeve near 70 degrees F, today (technically yesterday now) it snowed several inches of fluffy white snow. I grabbed my camera and snapped a few pictures, these are my favorite 2 of the whole bunch, no Photoshop editing, it is what you see. 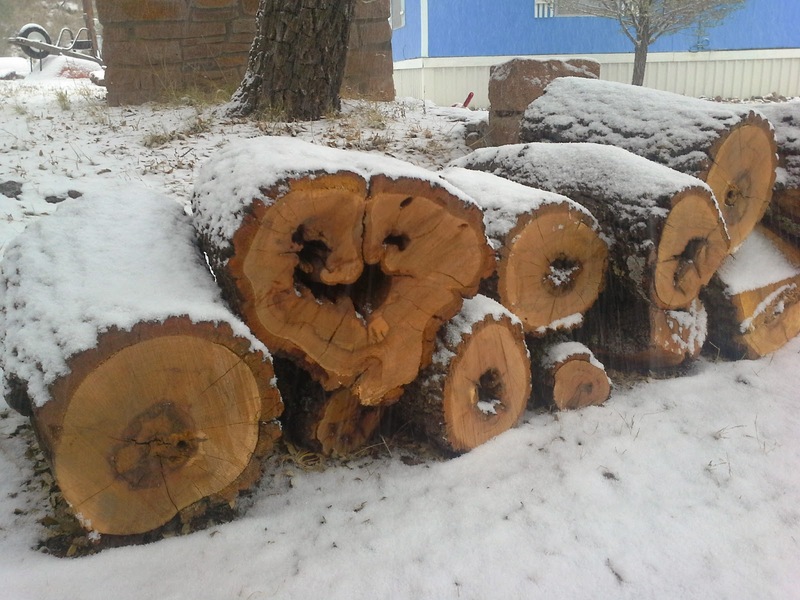 The first one is one of our wood piles, I thought the grain of the wood looked quite pretty, especially against the snow, one log looks like a heart. 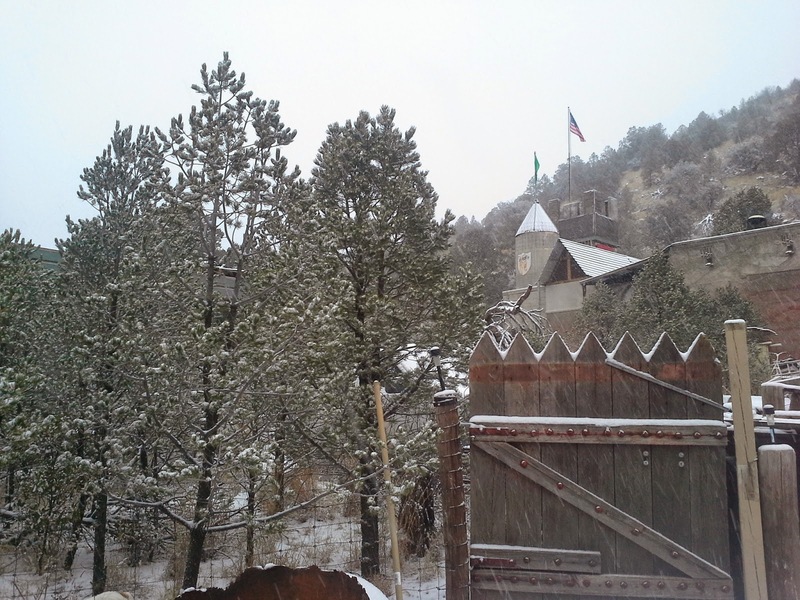 The second one is the Sky Castle, it always looks like a fairytale in its blanket of snow. 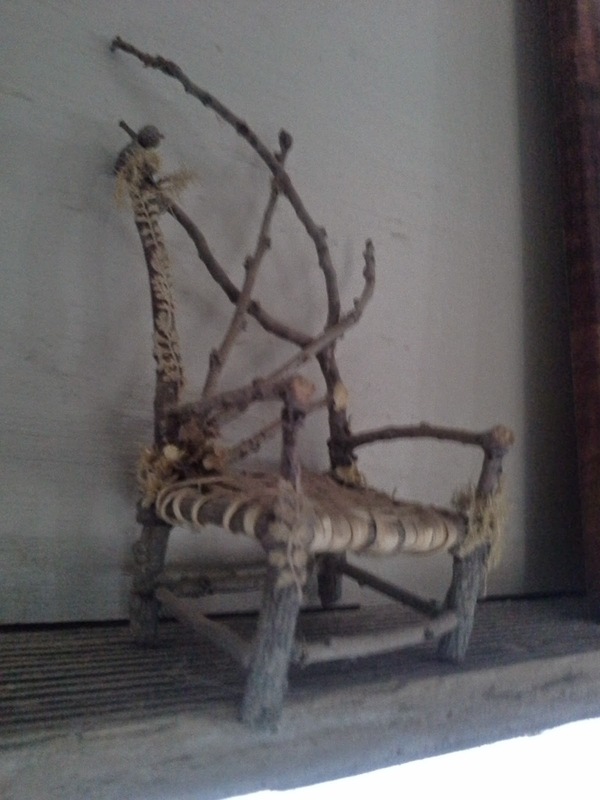 I decided to play with some photography today, I have 2 photos, the first is a chair done in the fairy furniture style, it's about 4 inches tall, I made this chair a few years ago, it now sits on a shelf over my bed. The second image, I snapped a couple of days ago, we had been having days and weeks of gray, gloomy, icy days, the sun finally came out and it warmed up, I went outside to snap a few pictures, when I got back inside, I realized I had snapped some 270 pictures! Oh well, I was inspired everywhere I walked. 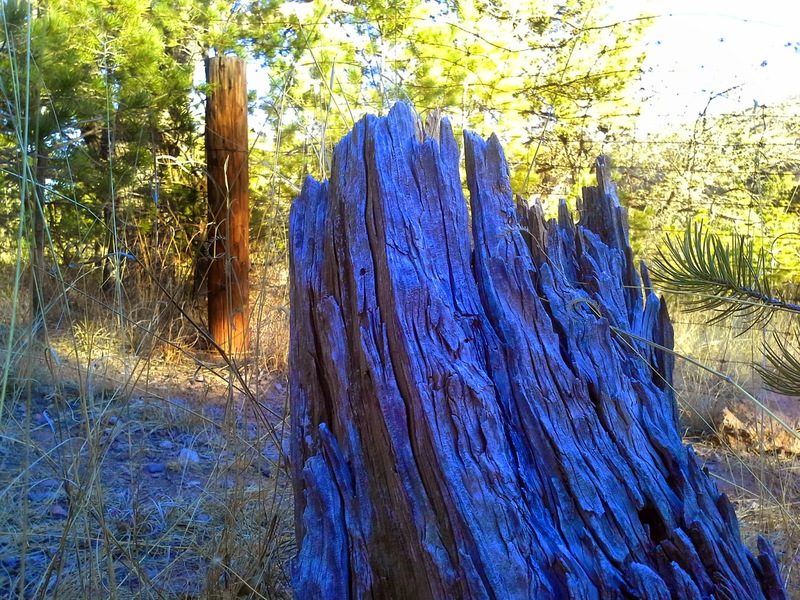 I particularly liked this one, the warm colored post in the background and the cool colored, gray, weathered stump in the foreground. I popped in into Photoshop and tweaked the image ever so slightly just to enhance the colors. 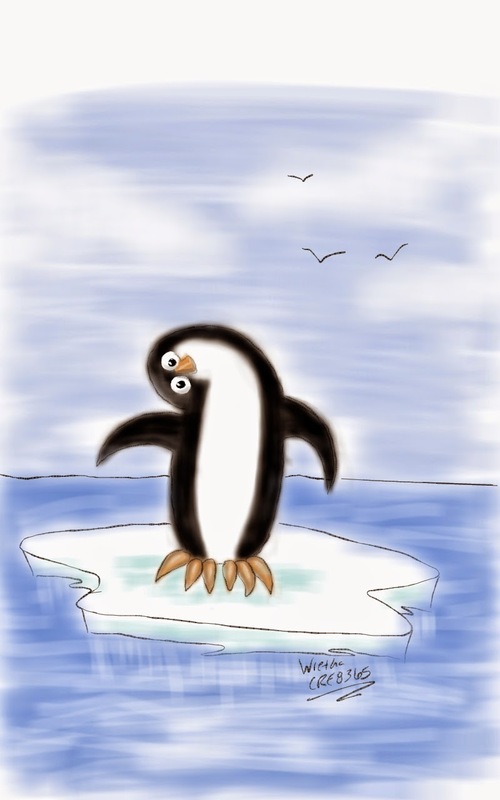 On day 20, the prompt was "penguin", well I figured I could do a penguin, a silly penguin in fact, so that's what I did. I created this in Sketch Guru. I really enjoy participating in the CRE8365 challenge to create something everyday, or most days, today on the site one of our artists posted a couple of tangles called Featherfall, the first one was nice, but the second one was spectacular, she had gotten some tips and advice on how to improve hers, she shared the tips on the site and it inspired me to try my hand at drawing Featherfall. I had seen it before but hadn't tried it yet, this image isn't polished or a "finished" work, it was just practice, but it still falls within the challenge to create something creative everyday. The black dots on the paper are the bleed through from the Winnie the Pooh drawing I did earlier, I didn't want to waste the paper, so I used it for this practice. You'll also see, on the bottom right corner another tangle called Puf, I saw this demonstrated on YouTube by Tiffany Tangles. 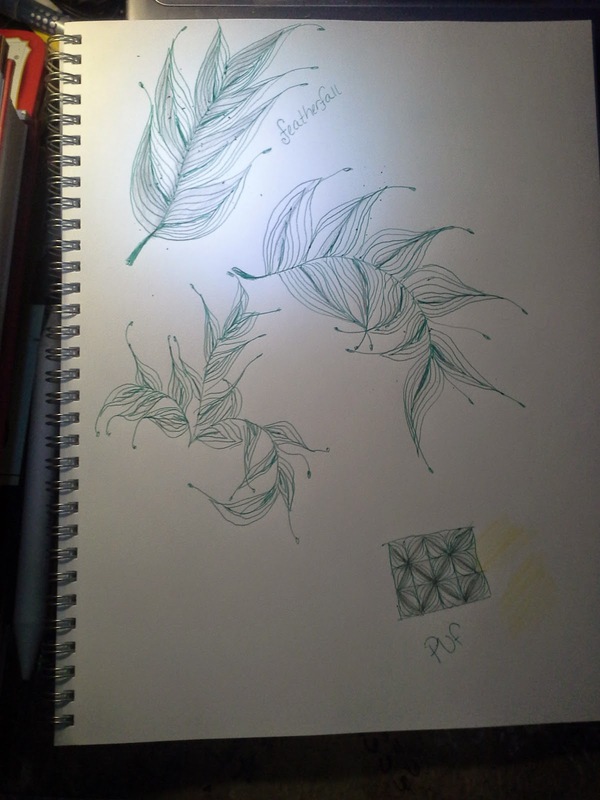 I used a green Inkjoy pen, just because it was handy, and I shaded it with regular pencil. 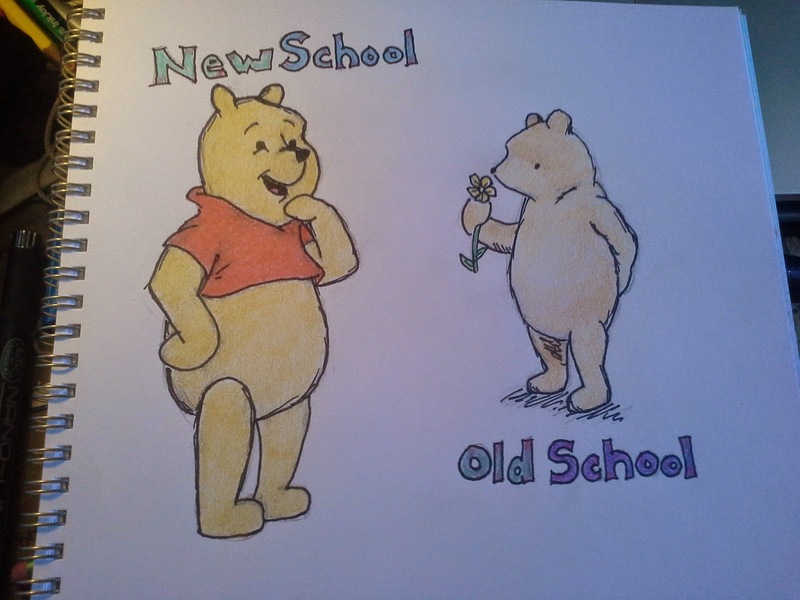 OK, now to my daily CRE8, the prompt for the day was Winnie the Pooh, a cartoon character I grew up watching and loving. 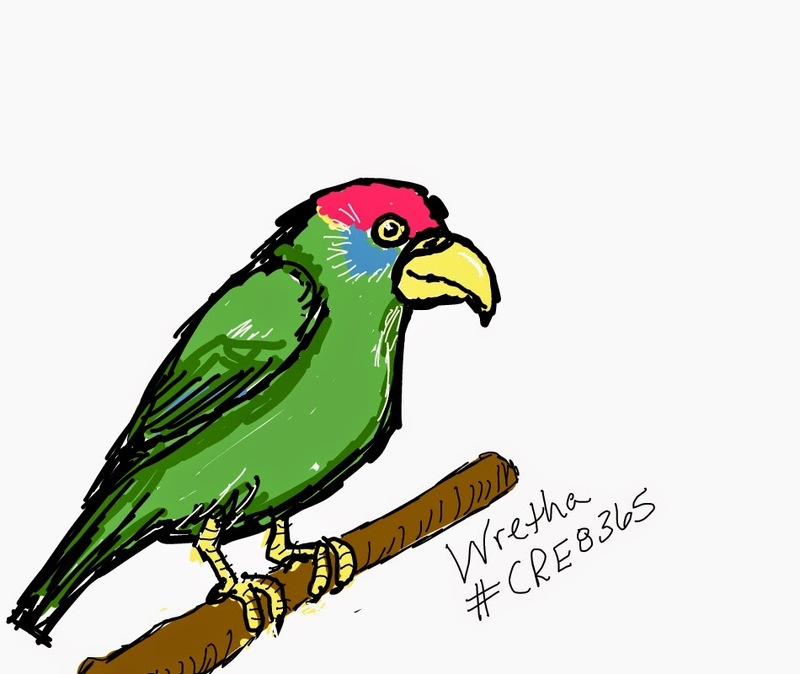 Several other artists on CRE8365 drew some really nice renditions of WtP, so I became inspired to try my hand. I decided to do a side by side of the newer Disney'esk style and the older, original WtP. 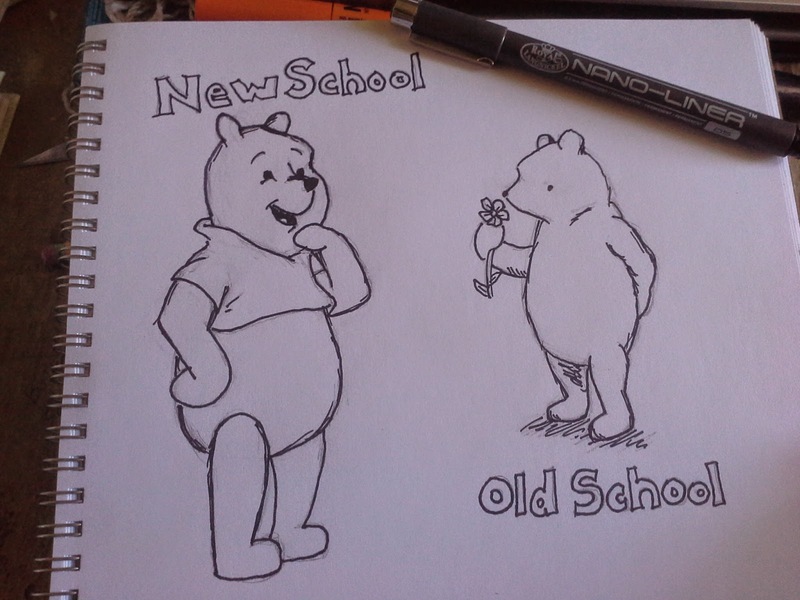 I will say right off the bat that I prefer drawing the older style. The newer WtP has more detail, the red shirt, but it's flat, no shading. The old school WtP has less detail, no red shirt, but the coloring is more delicate and has some subtle shading in the fur. 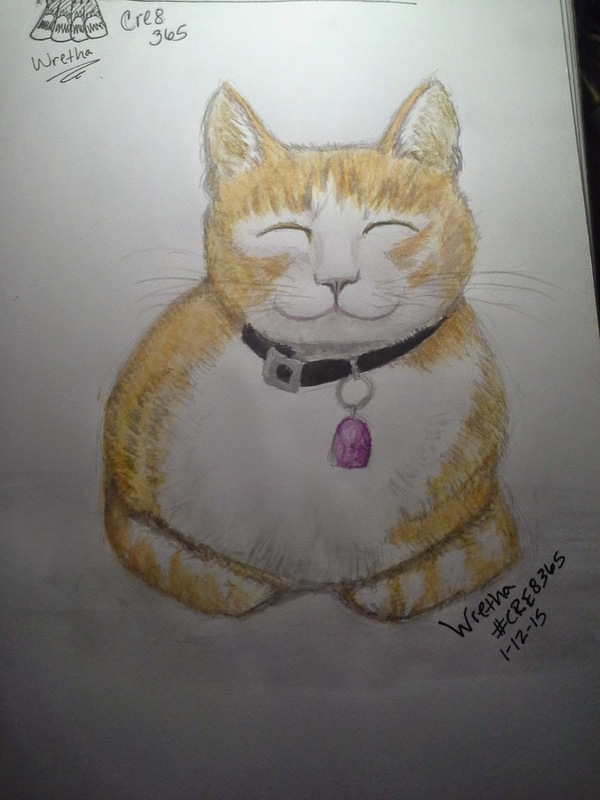 The colored pencils are cheap, but they work pretty well, they are not in the same league as Prismacolor pencils, but they work just fine, especially for doing something like this. 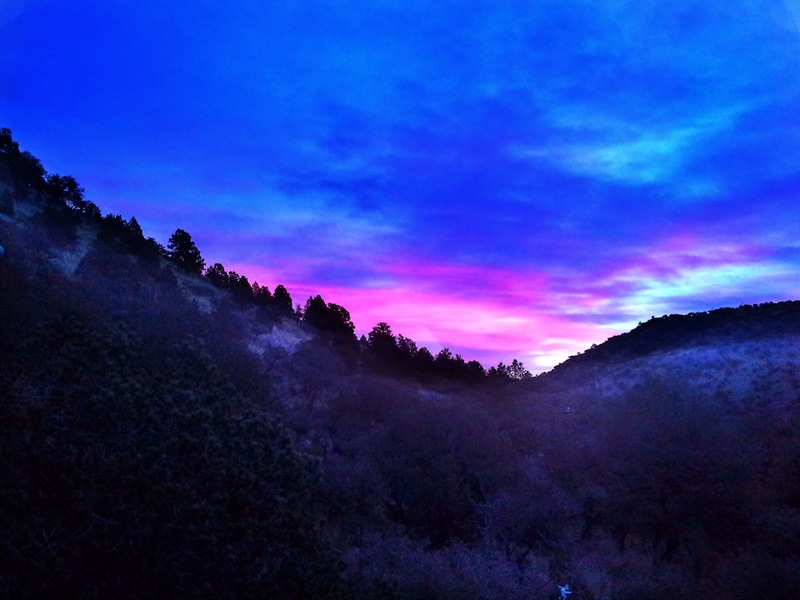 I really felt bad about yesterday's creative endeavor, so today I wanted to make up for it, I actually did 3 things today, the first 2 are photos I took this morning, the sunrise was so pretty. 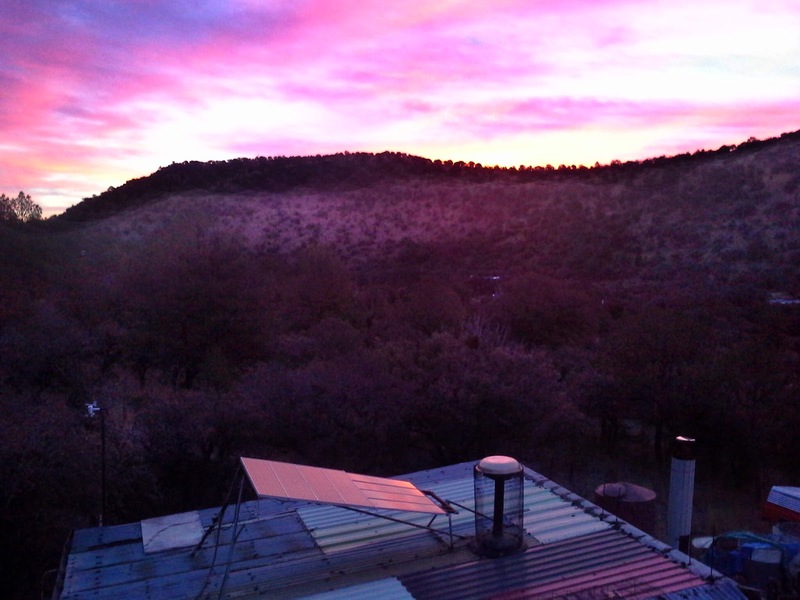 My camera is a lower end mid-range camera, good enough, but it doesn't capture the colors that human eyes can see, the biggest issue is having bright sky and dark land. So I ran the pictures through Photoshop and enhanced the color to make them look more like they really looked to me. I did make them a bit more colorful, but they are really close to how it looks to me. 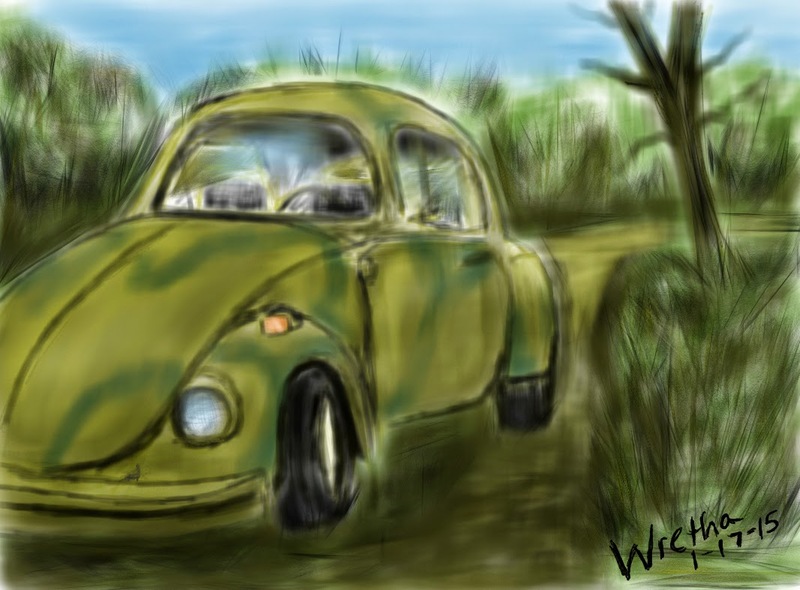 Later on in the day, I decided to get out Sketch Guru and paint from a picture I took earlier in the year of my old VW bug, it's sitting in my driveway, I love driving that bug, especially out where I live, we have 70+ miles of unpaved mountain roads, those old bugs really go on those kinds of roads. Hubby gave it that paint job, green camo. 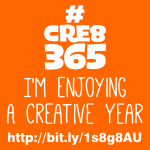 Come on over and join in with the creative fun! This was the first day I had trouble doing something creative, my sleep schedule had been really off, I was falling asleep, but still wanted to do something, anything, so I went to sumopaint.com and played for a few minutes, after a few starts and stops, I came up with this, not my best work, but it is creative. I was really looking forward to today's prompt on CRE8365, it is "dragon", I had been thinking for days about how I wanted to create a dragon, I knew I didn't want the obligatory dragon, there are plenty of evil looking dragons, I considered doing a cutesy one, but that idea faded as well. 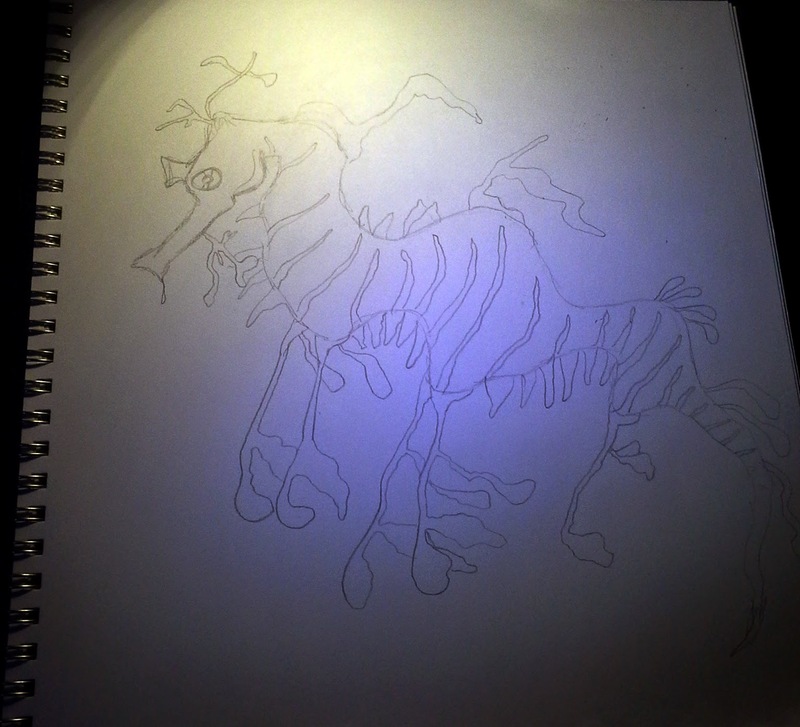 So I turned to Google image search and began looking for animals that resemble dragons, from moray eels, to lizards, then I went to sea horses, they certainly have a medieval look to them, then I stumbled upon the leafy sea dragon, that is a sea horse but with an interesting look. I originally wanted to do a sketch but then decided I wanted to take this further, today I stopped at the sketch stage, I popped it into Photoshop to darken the lines for today's submission so you can see it better, I wanted to leave the sketch light on the original drawing though, at least until I decide where I want to go with this. Today's post was fun to draw, the prompt for today is "pets in clothes", I considered doing a dog or cat, but Pixelista's post the other day mentioned Beatrix Potter, I remembered her books about Peter Rabbit when I was a kid, so this drawing is a nod to Beatrix Potter's Peter Rabbit, but as a grown rabbit, one that is in business, there is also a nod to Alice in Wonderland's rabbit, the one who was always late. 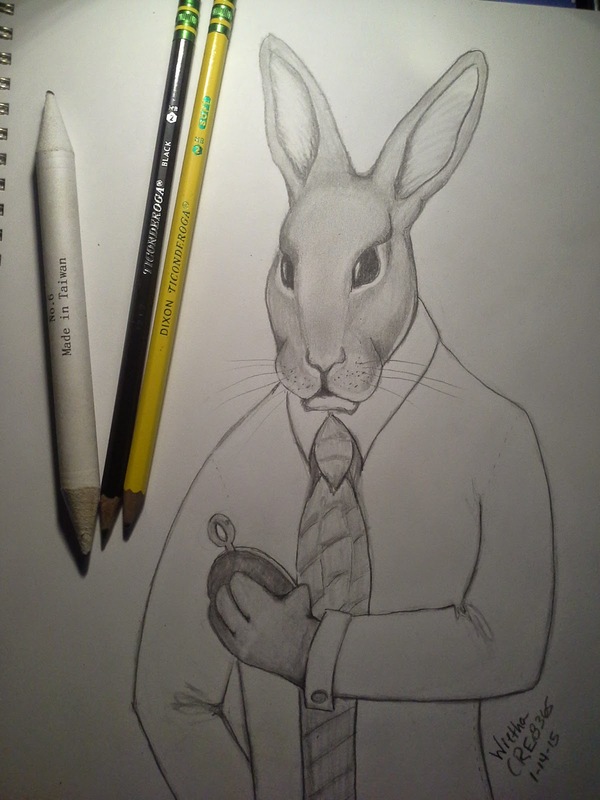 Peter grew up to be quite the rabbit and quite the businessman, his penchant for taking chances took him far on WallStreet. He is a snazzy dresser, preferring tailored, hand stitched white shirts, starched of course, with cufflinks, a real tie (no clip-on for him! ), but his favorite accessory is his pocket watch, it was a gift from Mr McGregor, who always felt bad about the times he chased Peter out of the garden. After Peter finished college, Mr McGregor was so proud of him that he gave him the watch as a graduation gift. I did this drawing using 2 different Ticonderoga pencils, the HB2 (soft) and the HB2 (black), I used a #6 blending stump, it's been a while since I've done more than just a preliminary sketch with my pencils, I was going to finish this using pen and ink, but decided I liked the semi-precise smudgy graphite pencil. 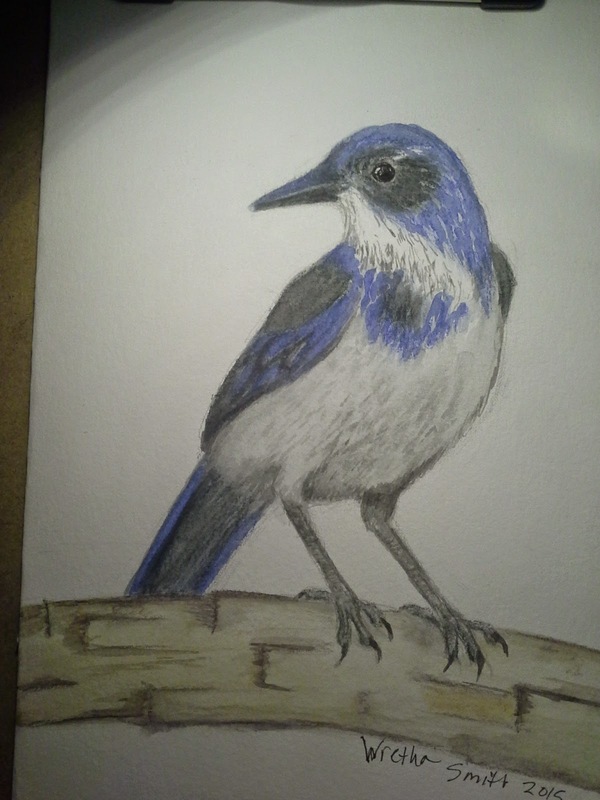 Today's submission is another bird, the Western Scrub Jay, a common bird that lives around us, they are related to the Blue Jay with similar coloring, size and behavior. They are raucous birds, flashy, you often hear them then see a flash of blue as they zip through the air from one tree to the next. 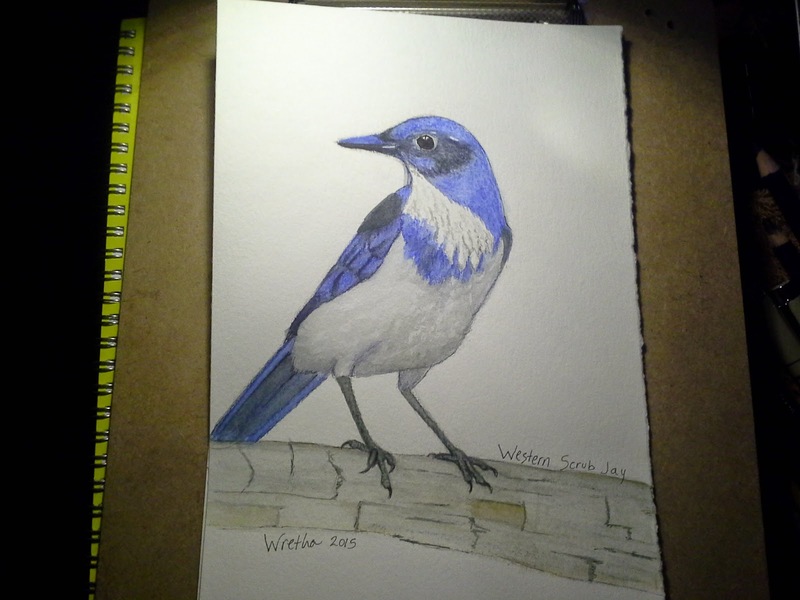 I drew this for my mother in law, a fine artist in her own right, I am making a series of our local birds to send to her in Dallas, a bit of a late Christmas present, I know she will enjoy them. I drew/painted this using Derwent Inktense pencils and Derwent Inktense blocks , I broke out my "good" paper, Canson XL Series watercolor, 140 lb, 9"x12" (cut in half). I have to say that I LOVE LOVE LOVE using this paper, the previous birds I created for Christmas was done on heavy cardstock, it worked just fine, but I feel like I have graduated to the big time with this watercolor paper, the pigment didn't immediately soak in, I was able to move it around without damaging the paper, I was even able to lift some of the pigment from the paper. I was also able to really wet the paper with water and do some subtle shading. I am technically posting this a day late, but I did start working on the image on the 12th, so it's really OK, and besides, there are no hard fast rules about HAVING to get something done each and everyday, though that is what I have set my goal to be. The prompt for the day was "happy", I couldn't think of anything other than the obligatory yellow smiley face, nothing wrong with that, but I knew I could do more. So I went to Google and search for "happy", the first couple of dozen images were of that obligatory yellow smiley face in all its different forms, then I began to see animals, mostly dogs and cats with smiles, natural ones, not digitally forced into a smile, though there were a few of those, most were just owners snapping pix a happy animal. I found this cat that reminded me of that lucky cat you often see at Chinese buffet restaurants, the cat has a big smile, closed eyes and a paw up in the air waving at you, there is usually money of some sort associated with this smiling cat. Here is the painting I created from that image, I used Derwent Inktense blocks and pencils after I sketched it in regular pencil. CRE8365 Day 11 - What do you see?